Does a lower income tax make for a happier country? How do you measure happiness you may think? It isn’t quantitative data you can collect. Yet, according to the World Happiness Report, Finland is the happiest country in the world. The report was compiled from the answers of a series of questions relating to the quality of people’s lives, from 0 to 10. The average was taken from over 2015-2017, with 156 countries taking part. But what adds to the joy of a country and its inhabitant? 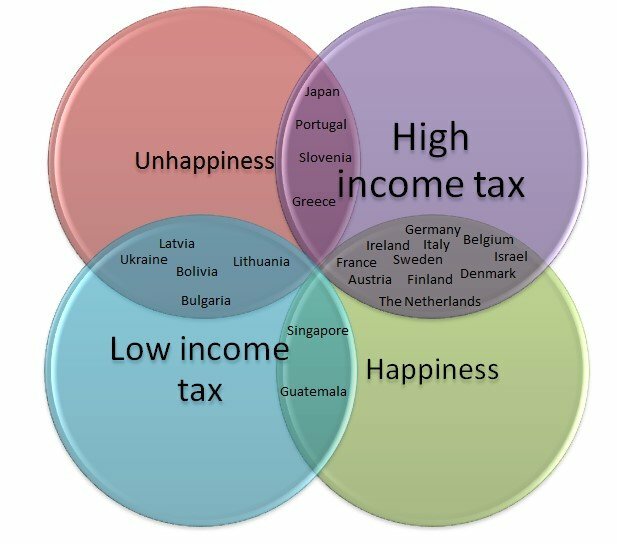 Is there a correlation between less income tax and happiness, for example, as we lose less of our hard-earned wage? Tilly Bailey & Irvine Law Firm, who are expert medical negligence claims handlers, explore the matter further. Cayman Islands — 0% domestic tax. The Bahamas — 0% income tax rate. Guatemala — 7% individual tax rate, 25% corporate tax rate. Bulgaria — flat 10% tax on all personal income. Bolivia — flat 13% income tax rate (but tax on luxury items varies, plus 13% VAT). Lithuania — flat 15% on all individual income. Romania — 16% income tax rate and corporate tax rate. Ukraine — 18% income tax rate. Singapore — operates a sliding scale. 22% on income over S$320,000 (£177,903); below S$22,000 (£12,230) is 0%. Corporate tax rate is 17%. Latvia — 23% individual tax rate. Corporation tax rate is 15%. So, where do these nations arrive in the World Happiness Report? In the report of 156 countries, we placed the benchmark at 50th place — anything above 50th place would be deemed “happy” and anything below 50th place would be deemed “unhappy” in comparison. Countries that did not register any data in the report were both The Cayman Islands and Bahamas, sadly. Guatemala came 30th, Bulgaria 100th, Bolivia 66th, Lithuania 50th, Romania 52nd, Ukraine 138th, Singapore 34th, and Latvia 53rd. Now, how about we contrast this with the most income-taxed countries. Nomad Capitalist named 15 high-tax countries: Germany, Ireland, Greece, Italy, Slovenia, Israel, France, Finland, the Netherlands, Belgium, Austria, Denmark, Japan, Portugal, and Sweden. Sweden has an income tax rate as high as 57.1%. So, regardless of the higher expense rates of these nations, just four have arrived under the 50th place bench-mark. In fact, four appear in the top ten happiest countries. None of the lower-tax rate countries broke into the top ten, in contrast. The Guardian investigated the higher tax rates of Sweden, and noted that the use of higher tax afforded the country numerous benefits: affordable childcare, joint parental leave of 480 days, pensions, and unemployment support of 80% of your previous salary for the first 200 days. Where did the UK place, you ask? Well, the World Happiness Report places the United Kingdom at 19th. Turns out, we’re a pretty happy country too! "How To Keep Pets Calm This Halloween & Bonfire Night"